Hot Chicken Salad and Green Bean Bundles are what I think lead to Shawn marrying me…thanks Karen! hmm…what is in a coca-cola salad, besides the obvious? Love it! No lettuce for me. My mom makes a corn salad that is SO good! “Black bean trash” with a blend of beans, corn, and chili’s, etc…or good ol’ fashioned potato salad. I’d eat it with everything. What is it about Southern folks that makes us name foods “trash”? Don’t get me wrong, I’ve eaten my share of tasty “trash,” but why? Drina, You might enjoy the “fried cobb salad” at this place in my hometown called “Up the Creek.” It’s a heap of deep-fried vegetables atop a thin layer of lettuce. With dressing, of course! I never realize these things until you say them. This is probably why when I tell people to bring salads to my outdoor grilling parties (not to be confused with a barbecue), they literally bring bags of greens, dried cranberries and sliced almonds. Delicious, but just not what I wanted. I’ve assimilated enough to know “salad” should include leafy greens of some sort, but now I’m thinking it would be amusing to show up at a so-called BBQ bearing a pistachio salad. Hey, at least it’s green. An unnatural shade of green, but still. Shrimp salad is the best followed closely by good SOUTHERN potato salad. However, I must say that I had not seen salad made with jello since the 1960’s (when it apparently was all the rage with women all across America who read Good Housekeeping) until I moved to Utah 12 years ago. It is still alive and well and served here at Mormon events or so I’m told. As an “outsider” I”ve only seen it at a couple of local buffets. One of the most popular selling collectible pins during the winter Olympics in Salt Lake was the green jello salad pin. It was the only one that I bought because I found in hilarious… and I still do. Well, I would If I could remember where I put it. Got a laugh from the ‘No Veggies…” That’s great! My mom used to make the Coca Cola Salad, and it was always a treat….lots of little crunchy walnut pieces in it. 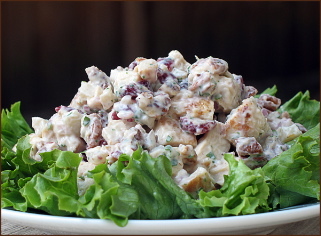 Also, there is nothing like a really good Southern Potato Salad! “green Jello” is indeed popular here! I remember as a kid in Oklahoma my grandmother made a cheesecake like “salad” for several church functions- I guess it was officially a salad due to the cherry and whipped cream. I personally like pea salad- but it consists of vegetables so I guess it doesn’t count! I like the idea of a cheesecake-like salad. Especially one with whipped cream. Yum! LOL!! I also love the Chinese buffets that feature French fries, mozzarella sticks, and, of course, pudding. Or sometimes Jello. When moving from Mississippi in the 70’s, mom ensured her Coca Cola salad recipe was packed. Yes, it includes one can of Coke as well as two varieties of Jello, black cherries, cream cheese, etc… It’s a wonderful Southern UN-salad. I’ve only made it a handful of times since moving to Kansas City 30+ years ago. 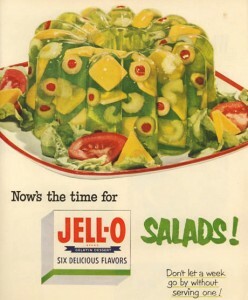 I don’t think Northerners or Midwesterners understand Jello salads.